It is the third consecutive year I have ridden the Charlotteville 50 mile TT on the Bentley (A31) H50/8 course. It is also the first standard distance, ‘non-sporting’ time trial I’ve done this year. Even for a relatively fast dual carriageway course, it’s still a bit lumpy – 1,545 feet over 50 miles. 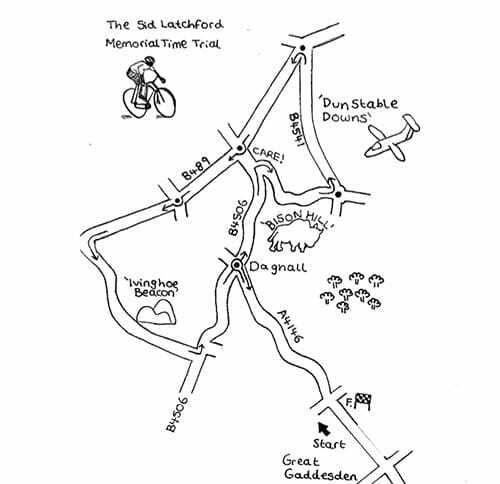 It is run on roads around Bagnall, Ivinghoe, Bison Hill and Dunstable Downs. There are two main climbs of Bison Hill and Invinghoe hill. It is good course, with a fair balance between flattish roads, and testing hills. On a good day, I can cycle from Oxford to Ivinghoe (about 40 miles), so I have done these climbs on a couple of occasions, but some roads were still new. The weather forecast correctly predicted rain and strong wind; I was surprised at the lack of DNS for the race. It would have been easy to look at the forecast and stay in bed, rather than put the clocks forward an hour and go and get a good soaking. It is estimated a close fitting skinsuit can save 3.2% of your total energy. This equates to 29 seconds in a 40 km time Trial. 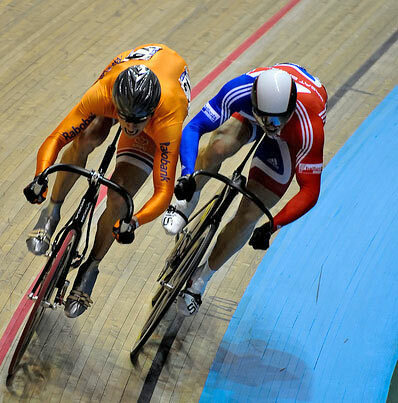 Therefore a close fitting skinsuit represent a cost effective way to improve aerodynamics and save valuable seconds. A time trial skinsuit will definitely be more aerodynamic. However, there can be a significant difference between a cheap time trial skinsuit that ends up being loose fitting and a custom built skinsuit which is absolutely skin tight. A key element in getting a time trial skinsuit, is not just the make, but also one that fits. A good time trial suit will be uncomfortable when you’re standing up. It should feel like your shoulders are being pulled down. A time trial skin suit only works when in the time trial position. In recent years, more of the top time triallist have been wearing custom skinsuits. Loose fitting club skinsuits seem to be on the way out for top cyclists. Which is a shame because it’s another thing which makes sport more expensive and I like seeing club kits rather than generic brands. But, if you’re competing for medals you don’t want to be throwing away seconds on flappy skinsuits. Even in road racing, skinsuits are becoming more popular as riders try to get all aerodynamic advantages. British Cycling are pioneers in this field. Nicole Cooke’s Olympic gold in 2008 were with a skinsuit. Also the British mens road team of 2011 where Mark Cavendish became World Champion played close attention to aerodynamics. Bristol South CC Megahilly definitely lives up to its name. 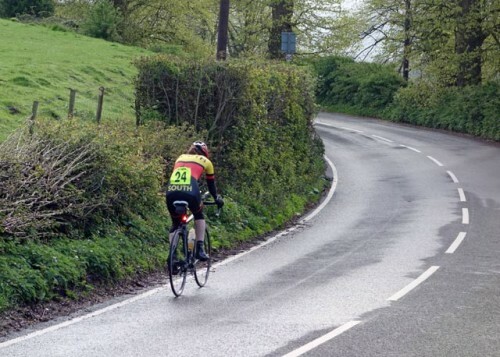 With 1,100 metres of climbing in 28 miles, it makes a strong claim to be the hilliest TT in the land – especially in terms of vertical ascent per distance. 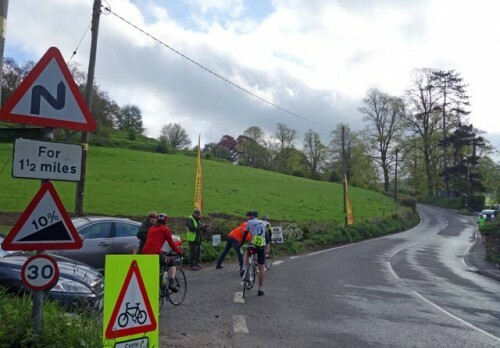 If I got to design a time trial course myself, it would be difficult to design a course more suited to my strengths than this 28 mile test, taking in 5 long climbs around Wootton, Dursely, Frocester, Uley and finishing off with Stouts hill. The Mega Hilly begins in the historic town of Wotton on the Edge. Straight from the startline, there is a testing climb of around 10%. It is nearly 150 meters of ascent right to the top. Though towards the end, the gradient eases off to be just a long dra. With smooth tarmac, it is tempting to go off too quick. But, after the pacing mistakes of Buxton MTT last week, I was determined to hold back and not get overexcited. At the top of the climb, you turn left for a tricky descent into Dursely. The descent was still wet from overnight rain – I took it steady, especially with tubs pumped up a bit too much. At Dursely, you turn back towards the village of Uley and a long drag along the B4066. After you exit the village of Uley, the gradient increases, and I soon found myself in the bottom sprocket 39*25. From the top of Cockadilly, you turn left down Frocester Hill. If you’re not racing, there is a fantastic view towards the Severn estuary – you can see for miles around. After a testing descent, there is a rare section of flat roads towards Easington where you do a U-Turn around a mini Roundabout. This was a chance to get low on the TT bike and pick up some seconds. There were quite a few riders using road bikes for this course. Road bikes must be tempting for quite a few reasons – better braking, lighter uphill, easier to manage on the corners. But, although they can be a bit unwieldily, I think the TT machine is always going to be 1-2mph faster (TT vs Road bike). Though I’m also pretty used to the TT bike as I’ve been training on it a lot. I rode a discwheel on the back; the only concession to gravity was using an ultralight weight ‘Lightweight’ front wheel, which rarely sees action outside the hill climb season. 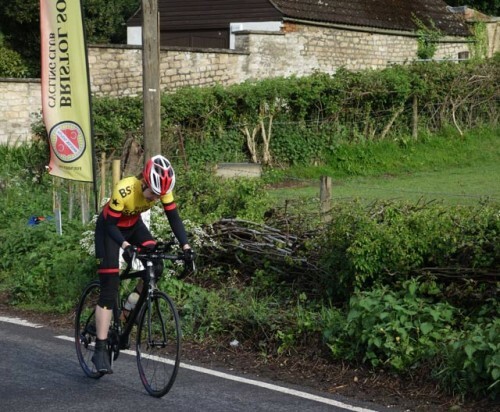 After a few miles of flat, your speed soon falls as you hit the lower slopes of Frocester hill. 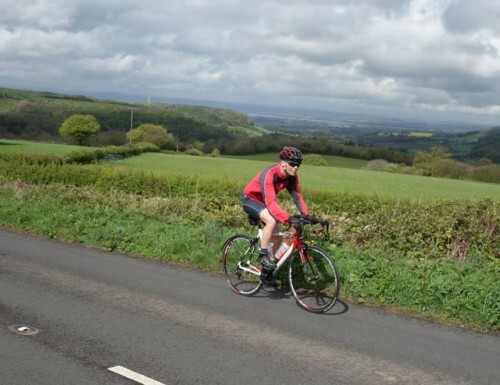 Frocester is a real beauty, nearly 200m of vertical ascent at an average gradient of 9%. I once cycled a round trip of 120 miles from Oxford just to have a go at Frocester hill, it’s definitely worth a visit to this part of the world. After surmounting Frocester, you turn left and there are a few false flats before another descent through Selsley into the outskirts of Stroud. Away from the professional world, there have been two recent successful attempts at different categories and variations of the hour record. Firstly, up is local time triallist, RAF engineer Justyn Cannon. Cannon successfully rode 47.220km on a track in Newport, 3rd Feb 2013. A very good distance for early February and for a rider who has done very little work on the track. It’s particularly interesting for me, because I often race against Justyn Cannon and we are often pretty close in local time trials. It must be a great feeling to actually put the kms on the board and beat the old Combined forces record of 46.5. It seems Justyn was training very hard over Christmas. “I train three times a day, including doing two hours on Christmas Day.” ! 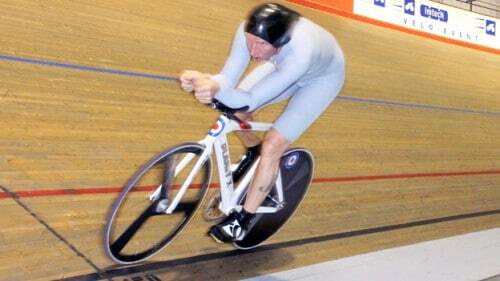 One thing about the World Hour record is that it must feel an all or nothing achievement. You either break the record or you don’t. You can prepare for months, but it all comes down to whether you can break it. Even attempting the record takes courage. Recently Robert Marchand, a 102-year old rider from France, beat his own hour record on the newly opened cycling track in Saint-Quentin-en-Yvelines on Friday. Marchand set a new hour record for the UCI 100-plus category which was created especially for Marchand. The record now stands at 26 kilometers and 927 metres. 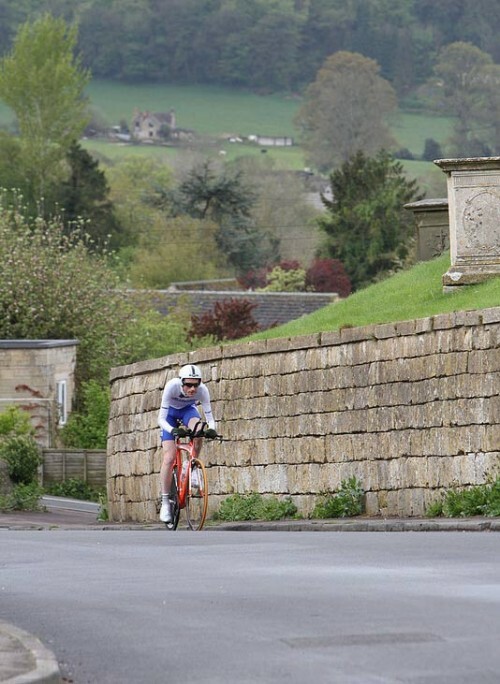 At the risk of stating the obvious, the 100 mile TT is a formidable challenge. It’s one thing to ride 100 miles, but to race 100 miles, is quite a challenge. A quickish rider will be able to do it in 4 hours. 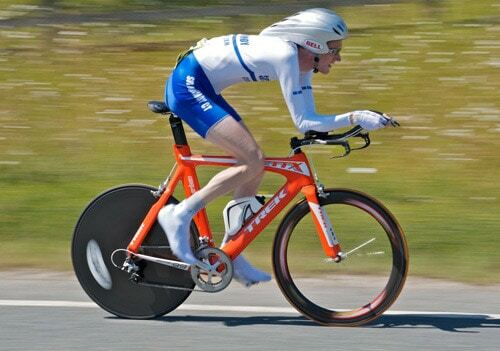 The record for 100 mile TT is Kevin Dawson (03:22:45) in 2003. If you think that sounds fast, Ian Cammish did 3:31:53 in 1983 before tribars and discwheels. 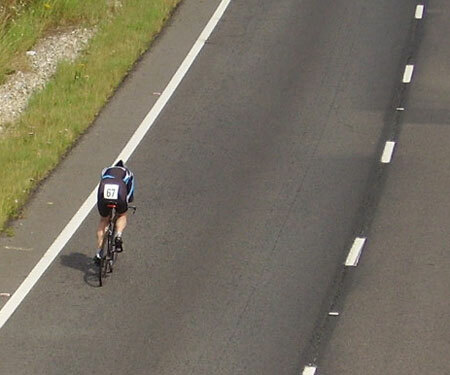 A 100 mile TT is possibly cycling’s answer to the marathon; it’s a similar effort in terms of time. The obvious starting point for doing a 100 mile TT is to do sufficient aerobic endurance training. If you are starting from scratch, this will take a good 6 months to build up. You can do 10 mile TT or 25 mile TT on little training, but unless you want to suffer like anything, you need that base endurance to be comfortable sitting in the saddle and able to complete the distance. As a minimum, I would suggest you need one long ride of 3-4 hours every fortnight. If possible, you would make it more frequent and longer. In winter and early season, I would do these training rides around level 2, so it is around 70% max heart rate. around 60-70% max threshold power. These aerobic training slowly build up aerobic fitness, fat-burning capacity and ability to cycle for long periods. There are also smaller benefits for top end performance, such as increased lactate threshold. But, this is the first priority in terms of training for 100 miles. At the least, I would do a ride of 80 miles before racing. If you’ve already done a 100, it will be good for your confidence psychologically. But, it’s not essential. I know a few good time triallistswho will only do over 80 miles in a 100 mile TT. To maximise my chances in the 100 mile TT, I will be concentrating on the winter months in building up a strong aerobic endurance. At the moment, in November, I’m trying to do two long rides a week of 5-6 hours (averaging about 16mph). The average speed is not important. These are the classic long slow distance rides (LSD); you can easily do it with other riders. With a couple of shorter rides, it provides quite a strong framework for later in the season. At this time of the year, I don’t see these as ‘junk miles’, but an important foundation for increasing intensity in Jan and Feb. Throughout Dec, Jan and Feb, I will continue to work on this aspect of cycle fitness. I don’t rigidly stick to level 2, but sometimes in the year it is good to concentrate on a particular type of training, after a long seasons hill climbs, endurance training seems a nice break from top level intervals. A very rough target is to manage 1,000 miles a month in winter. But, these days, I’m less religious about clocking up the miles. It’s important not to get carried away and maintain a good balance between rest and training. This balance is different for different athletes. In my first season, 1,000 mile a month would have left me pretty tired, after a few seasons accumulation in fitness, it is more manageable. But, in the winter, I still leave a good two days of rest or very easy riding. Also, in a month, it’s good to vary effort from week to week. Perhaps 3 weeks of 200-300 miles, and in the fourth week have much lighter week. A typical cyclist might be racing a 100 mile TT at around 80-90% of threshold power. e.g. if you average 300 watts for a 25 mile TT, you might do well to average 250 watts for a 100 mile TT. This effort level of 10-15 % below your threshold for an hour, is often termed sweat spot training or ‘tempo’ training. It is called the sweat spot because you can gain big improvements in fitness, with only relatively limited muscle damage and tiredness. If you race at threshold or above, you can make more gains, but also face greater fatigue and need more rest. Therefore, in training for a 100 mile TT, a very good training schedule will be to incorporate these ‘tempo’ rides into your training. Early in the year, you can start off with just doing one hour at this tempo of 80-85% threshold power. You will need to concentrate to maintain the power and effort, conversation is no longer really possible; it will be difficult to do in a group, unless you have a small number of riders of similar ability. As the year progresses, increase the duration of these tempo rides from 1 hour to 2, 3 and even four hours. This is training which closely matches your race pace, so it is targeted training to the race effort of a 100 mile TT.